Clay joined the TAP team in June of 2016 bringing his 15 years of printing experience, 8 years experience as a graphic artist and 7 years of shop management to the table. After gaining experience working in a couple print shops in Phoenix, he eventually went on to run the in-house shop that was started for his father’s corporation, eventually taking that shop over and opening it up to the general public. During that time, he provided printing, design services, website design and marketing consulting to his faithful clients. Clay works is the operations manager here at TAP. He assists the owners in overseeing the entire operation and holds down the fort for them when they are gone. He also oversees our sales and marketing and is our website designer. He is also is one of the installers for signs, graphics and wraps, and does most of the wide format and small format printing. He is an Ambassador for the Bullhead Area Chamber of Commerce and the President for the Bullhead Business Builders and Secretary for the Kiwanis of the Colorado River. Like most everyone else, Clay has his hands in a lot of different things. In his off-time at TAP he works for his Dad’s dental plan and helps out with the business aspect of his cousin’s auto repair shop. 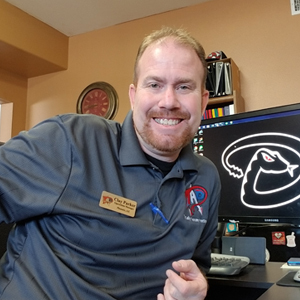 He is also the marketing advisor, graphic designer and website designer for Arizona Facts Of Life, a non-profit organization in Phoenix, Arizona that helps kids and family with a wide a range of issues. When he is not at TAP and has spare time, Clay enjoys playing music, watching baseball, spending time with family and friends, playing with his dog, Jenna and going to the river.